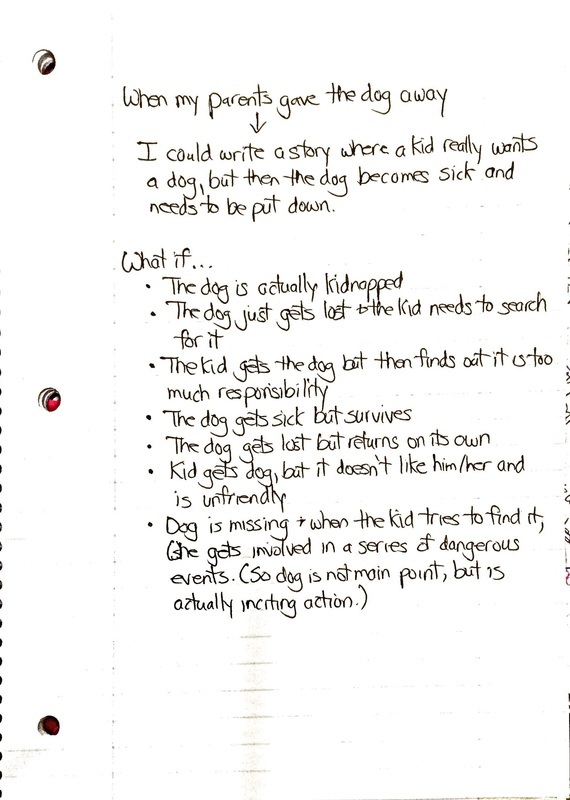 ​Our first writing unit will be writing realistic fiction! What is it? Realistic fiction is literature that, although untrue, could actually happen. Some events, the people, and the places may even be real. When you hand in your final published short story, I will be looking for the following criteria. Use the checklist below to assess your writing and to create goals for yourself! Writers get ideas for fiction by paying attention to the small moments in their own lives. Fiction writers often get story ideas from observing, not the cloud, but real life. S.E. Hinton got the idea for Outsiders when she was 15 and one of her friends got called a “Greaser” and was beaten up while walking home from school. Hinton was so angry about what happened to her friend that she went home and started to write a story inspired by that incident. John Green got the idea for The Fault in Our Stars from a friend of his who was sick. But, writers don’t just record exactly what happened and call it fiction. The secret in what fiction writers do is that they can find significant stories in sometimes the most ordinary moments in their lives. They get ideas for fiction by paying attention to the small moments in their own lives and then using those moments as inspiration. They fictionalize aspects of those moments to create stories. Think about moments of conflict in your own life and see how you can fictionalize them! Take your story ideas and ask yourself "What if..." or "Maybe..." Come up with different scenarios of ways that your story could go. Play around with character, the conflict, the effects, the setting, etc. Think of as many different scenarios as you can! You can do this in the form of a bulleted list, a web, or any other way that makes sense! ​Strong writers explore possible stories by “writing long” off of seed ideas. At this point, you have a tremendous amount of story ideas from which to choose! But, another thing that writers do before embarking and committing fully to an idea is to “write long” off the idea to see how it might sound and see if they like the direction it’s going. Sometimes it’s only when writing out and exploring the idea a little more do you realize some of its flaws - or some of its secrets/gems! You can "write long" off a seed idea in 2 ways. You can either: (1) choose a scene and write in the moment, or (2) summarize or write more specifically how that story might go. 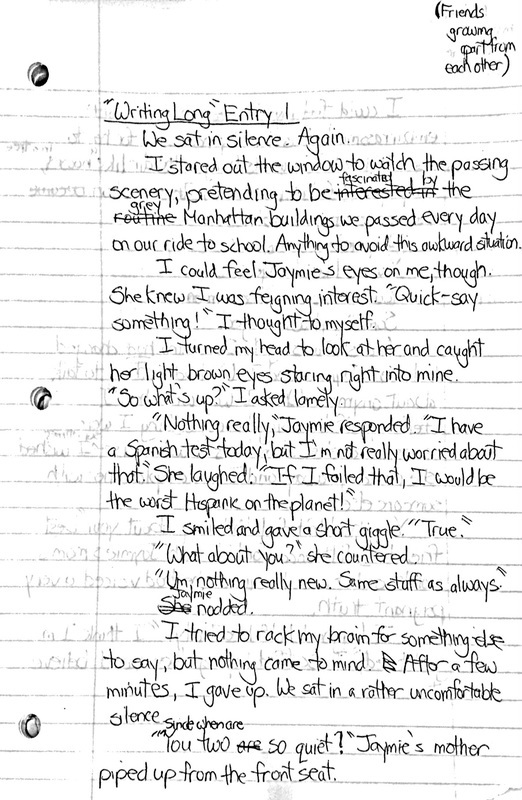 These two pages uses the first method - choosing a scene from the story and writing about it in the moment. 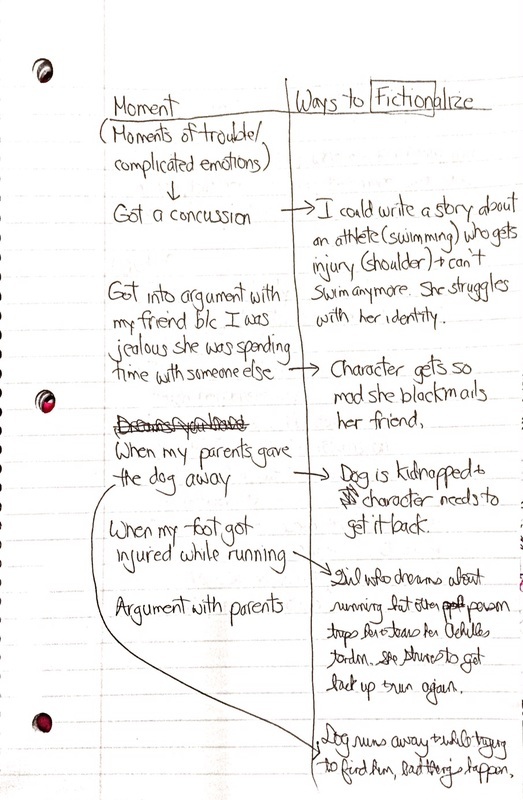 ​This example uses the second method - summarizing or writing more specifically the way that the story could go. ​Good writers start to develop a story idea by asking themselves questions that help them establish concrete ideas about the character, the challenge the character faces, and how the character handles that challenge. ​Strong writers of short fiction keep their plots manageable by focusing on three main parts. Strong writers improve their drafts by using a mentor text to identify author’s craft moves they might try. ​Strong writers bring out the heart of their story by purposefully crafting the shape of their story. The "heart of a story” is what the story is really about. It is the theme/message. Why are you writing this story? What is its purpose? What are you ACTUALLY trying to say? 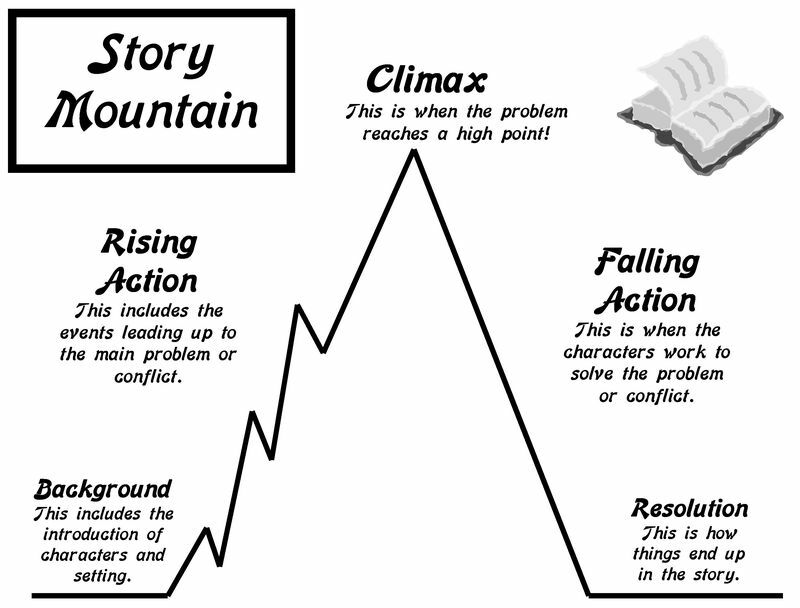 ​ Writers use the structure of their story purposefully in order to bring out their meaning. As you revise, think: "How can the shape of my story - where it stops, where it ends, maybe even the peak of the arc - showcase the truth of what I am saying?" Choose 1-2 parts that the most important in showing the "heart" or theme of your story. Try working on revising that scene to make sure your theme is really clear to your readers. Strong writers of short fiction stretch out important moments by using the technique “show not tell”. One way that authors bring out the heart of their story and highlight other important parts is to slow down the moment by SHOWING, not telling.